Ah, the inhumanity of it all!!! WarWatch . org shows its absolute disdain for reporting the truth, as it always has. TruthinDissonance.wifi reached Dr. Hudson, and has exclusively reported that the so-called "War" (merely a ill-gotten fabrication in an old piano-playin', guitar-strummin', banjo-pickin', and all-around bitchin' ex-WOULD-be Naval Musician is just that - a fabrication. The "War" is still on! 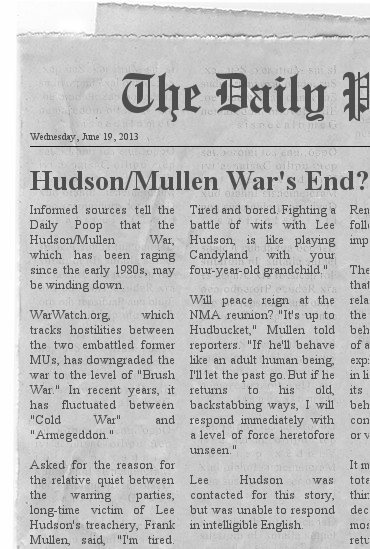 The last salvo of rubber band shots were fired by MUCS Hudson while at the last NMA Reunion. (Matter of fact, it was with a howitzer - a rubber band about a foot long!) IMe thinks Sir Frank is still smartin" from that one, and seeks to recruit misguided MUs, (both old, new, and in-between) to try to submarine the entire theatre of operations. 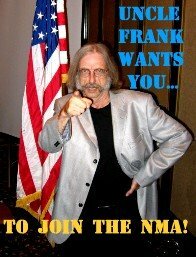 Wake up NMA, the War still rages! !